Constipated? Check out my infographic. So I’ve created my first infographic. Actually, make that my second infographic, after creating one to then lose it into the ether that is the internet. I blame that ridiculous and archaic Internet Explorer. Yes, it would take someone else about 20 minutes what took me four hours to complete, but I’m not much of a ‘picture’ person – i.e. when told to ‘mind map’ and given a blank sheet of paper that requires clouds, arrows, dots and stars, I fail to connect one cloud to the other. Seriously, just write a list. Not as cool but I understand it a LOT more. I can’t read maps. Anyway. The infographic. Born from personal experience, I could have written a post about it but (lucky you) chose to create an infographic with some of the highlights. Nothing terribly specific and not all remedies will work for all people – but it’s not a bad start if you’re suffering from a bout of acute constipation. After back to back clients two days in a row and failing to drink enough throughout the day, dehydration was the likely cause of my gastrointestinal upset. By ensuring I drank enough – along with some additional magnesium and slippery elm bark – I got all systems back up and running (so to speak). So… there you go. 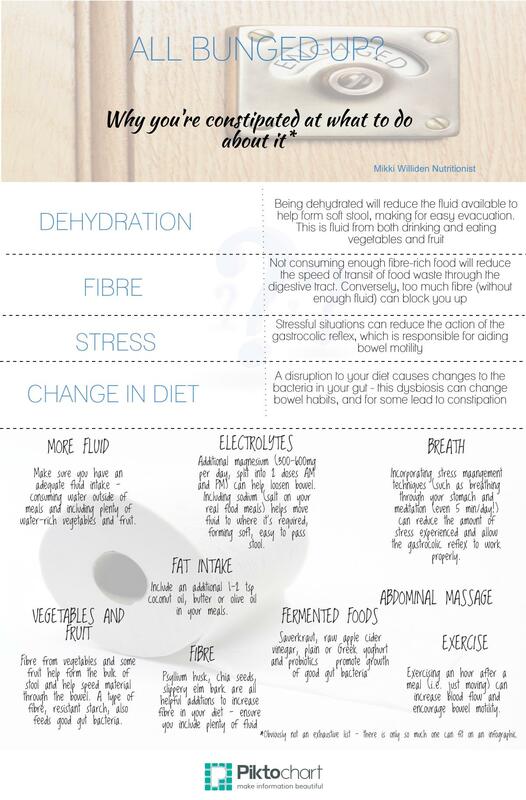 Have a look, print it out and put it on your fridge – it may come in handy sometime :). PS if you rely on caffeine to move things through, then that’s not ideal. And if you know a certain type of food (i.e. dairy, gluten-containing foods) give you digestive upsets then you need a closer look at your diet.